SPOKANE — The Seattle area’s concentration of hospitals, clinics and people has long made it the epicenter of medical education in this state. But due partly to Washington State University’s legislative win this year — which gave it money and the go-ahead to open a new medical school in Spokane — the center for early medical education is beginning to tip east. If all goes as planned, Washington State University Spokane will open a new medical school in fall 2017 — likely named for Elson Floyd, the late WSU president who fought to make it happen even while he was dying of colon cancer this spring. Meanwhile, the University of Washington’s School of Medicine plans to more than double the size of its Spokane medical-education program. On top of that, the private, nonprofit Pacific Northwest University of Health Sciences (PNWU) for osteopathic medicine is growing, with up to 140 first-year medical students a year in Yakima. 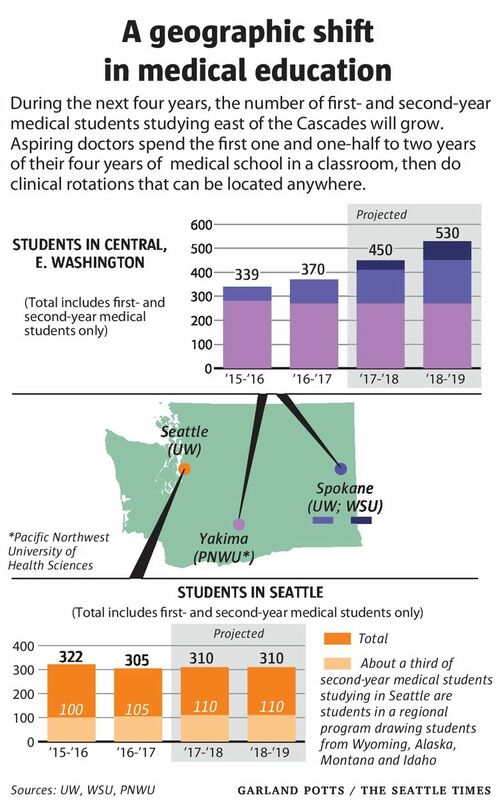 Even this fall, two years before WSU’s medical school opens, there already will be more first- and second-year medical students studying east of the Cascades than in Western Washington. 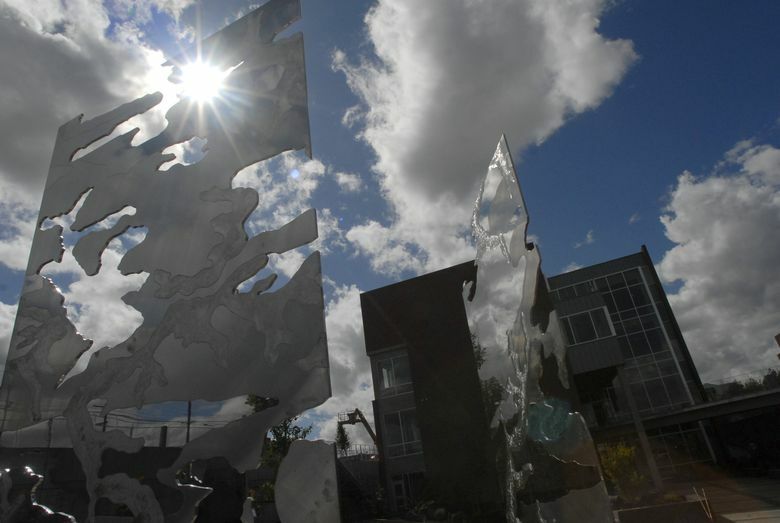 The shift east is partly the result a yearlong public battle between WSU and UW over which school was best qualified, and most committed, to expanding medical education on the eastern side of the state. Aspiring doctors who grow up in this state now have a much better chance of being able to go to school close to home — at roughly half the price of an out-of-state medical school. And state officials hope many physicians who train here will stay here — especially in the small towns and rural areas in Eastern and Central Washington that face an acute shortage of doctors. Western Washington still hosts the majority of residency programs, the training that doctors complete after they’ve graduated from medical school. And Western Washington is where most doctors may still end up, given that where residents work is more predictive of where they will eventually put down roots. Of the 1,600 residents in Washington, only 100 work and learn east of the Cascades. Still, the new boom in medical education is clearly a big plus for doctors-to-be, for Eastern Washington and especially for Spokane, which will go from one small program to two robust ones in just a few years. “I would say the outcome has been extremely favorable to Spokane, yes,” said Rich Hadley, the former CEO of Greater Spokane Incorporated, the city’s chamber of commerce. WSU Spokane Chancellor Lisa Brown, a former leader in the state Senate, described it as this generation’s Expo ’74 — the 1974 world’s fair that took place in Spokane, drawing 5 million visitors and redefining Washington’s second-largest city. There’s no dispute that Washington needs to train more physicians, especially to work in rural areas. About 4,700 of Washington’s roughly 20,000 doctors are 60 or older — on the verge of retirement. Yet last year, the UW’s School of Medicine only had room and funding to admit 121 Washington students for the first year of medical school (100 in Seattle, 21 in Spokane). PNWU, the osteopathic school, admitted more — about 140. Most of the 800 state students who were aspiring doctors had to move away to get their training, or were turned away. The new medical school — plus the expansion of UW’s Spokane program — will help. Next year, the UW expects to have 100 first- and second-year medical students studying in Spokane. The following year, WSU will open its medical school with 40 new students. If the UW can get legislative funding, it eventually hopes to bring 120 students a year to Spokane. That’s more than the 100 state students the UW admits annually in Seattle. For Spokane, medical education also means economic development. According to a study, a medical school will usher in $1.7 billion in economic impact and draw biomedical companies to the city of 212,000 people. Part of that will be research money, because the national committee that accredits medical schools encourages medical schools to offer research opportunities to students, said Ken Roberts, interim dean of WSU’s medical school. In 2013, WSU Spokane spent $12 million in total research and development money from federal and private sources, including support for its nationally recognized sleep center. With the new medical school, administrators hope to bring in millions more. And the researchers will benefit from the arrival of the medical school, giving them a ready pool of bright young students eager to help. The Sleep and Performance Research Center, located in a one-story brick building on the edge of campus, is a prime example of the kind of research WSU Spokane hopes to nurture. Opened in 2004, when former U.S. Rep. George Nethercutt helped win federal funding for the program, it studies how sleep deprivation affects cognitive performance. Its findings are used by airlines, trucking companies and the military, just to name a few, to find optimal schedules for workers. Director Hans Van Dongen has studied and written extensively about sleep and performance, and is considered an international expert in the field. Formerly with the University of Pennsylvania, he’s the caliber of researcher WSU Spokane hopes to attract and retain with the addition of a medical school. One concern with bringing so many young medical students in Spokane is whether the city will have enough doctors willing to teach them all. Not every practicing physician wants to mentor a young medical student or resident, he said, because students can take time away from caring for patients. Still, she said, the reception in Spokane has been good. “We have all kinds of physicians coming forward saying they want to teach in the classroom,” she said. There are also questions about facilities. For now, the UW students will use the WSU biomedical-sciences building for their training, but UW’s program will eventually need its own space. To that end, the UW is working on a partnership with Gonzaga University, on the other side of the Spokane River. And some longtime observers wonder if the UW will end up expanding as much as it says it will. Watson noted that the UW long promised to expand the Spokane program, but it wasn’t until WSU President Floyd forced the issue and started lobbying for a WSU-run medical school that the UW began working on growing the WWAMI program. UW officials have said the delay was due to timing; it wasn’t until this year that money was available, thanks to the improving economy. Going forward, both schools will have to mend fences, acknowledged Ana Mari Cauce, interim president of the UW. In the meantime, the UW underscored its commitment to Spokane this summer by opening a small welcome center for all students and alumni just blocks from WSU Spokane. Catherine Brazil, a third-generation Spokane Husky, will direct the program. “It’s kind of an exciting time — like putting a purple stake in the ground over here,” she said.